It took me forever to figure out what to write for this! I knew that the Redo challenge needed to be October's Secret challenge, which I missed, but Secret was much easier to do while sewing, putting a little secret embroidery or hidden pocket. At last I remembered an historic dress that has its own secret. This gown, in the collection of Old Sturbridge Village, was among the ones I evaluated for patterning when I went there last year. And because it appears to be a lovely early 1820s evening dress, I patterned it. But while I was patterning, I realized that this lovely gown holds a terrible secret - it's not from the period! It's the best costume/reproduction I've ever seen in a museum, to the point where I really grappled with myself in deciding what was going on with the gown: idiosyncratic Regency garment, or very well-made costume? In the end, I decided it was likely a costume, despite the fact that it's entirely hand-sewn. First: the materials. 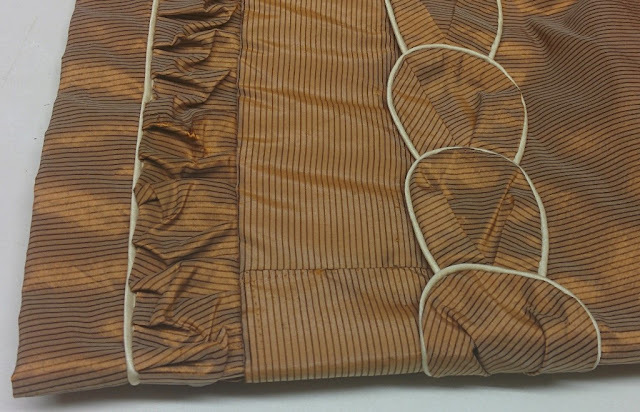 The bodice is lined in a brown cotton, and the gown is trimmed with a combination of the same striped taffeta as the gown and a white silk satin. 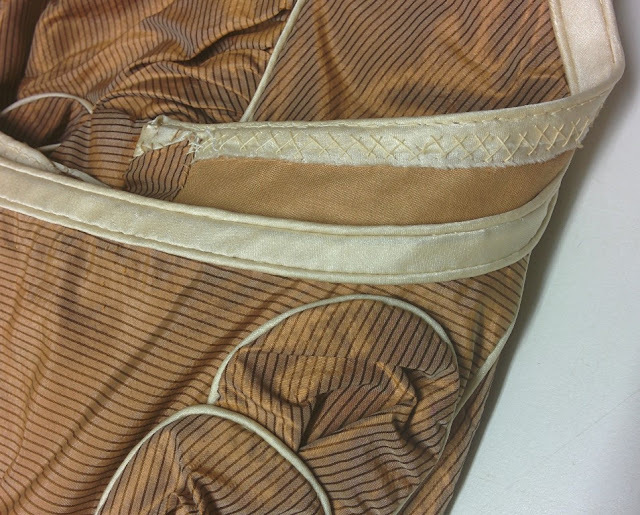 The cotton lining is much flimsier than you generally see in early 19th century clothing, and brown isn't a common color for linings at that point. The satin trim is also a warning sign. Although satin was used for edging necklines and pieces of trim, it's much more usual to see it approximating the color of the gown, or one of the colors of the gown if it's striped or otherwise patterned. Such a strong contrast isn't common at all. Overall, the trim at the bottom of the skirt seems very understated for the early 1820s, too. But the construction is where it really becomes clear that Something is Going On. The bodice is cut with side front seams up to the neckline, as you find on the Albany Institute's Pingat evening dress. And the skirt is cut with two panels on each side forming a trapezoid, flaring in front and in back, rather than solely to the back. My guess is that this was made in the late 1860s or 1870s, when the side-front seam-shaping and satin piping and bias trim turns up in fashionable clothing, and when hand-sewing was still done to a certain extent. And it must have been made by a seamstress who had access to or experience with early 19th century clothing, because certain aspects seem fairly authentic. But a costume nonetheless! Although I did not include this gown in Regency Women's Dress because it's not really from the period, I salute the figurative ancestors of all of us in the community who made and wore it. Oh, yes, a label would have been so helpful! And, since I like your blog a lot, I have nominated you for an award here: https://sewingempire.wordpress.com/2016/01/01/a-way-to-start-2016-blog-awards/. Thank you so much! I will definitely answer those questions soon.